Betty Louise Jenkins Burton, age 94, of Claremont passed away on Wednesday, February 6, 2019 at Catawba Valley Medical Center in Hickory. Born October 29, 1924 in WV, she was the daughter of the late Grover Earl and Julia Massie Jenkins. 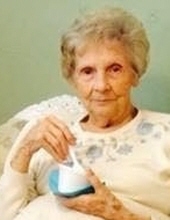 In addition to her parents, she was preceded in death by 2 daughters, Elizabeth Gabriel and Sherry Cajigal; 4 sisters, Ruth Jones, Margaret Tice, Joyce Bocock and Jean Helvey and a brother, Earl Jenkins. Memorials may be made to: www.alz.org. Burke Mortuary and Crematory in Newton is serving the Burton family. To send flowers or a remembrance gift to the family of Betty Jenkins Burton, please visit our Tribute Store. "Email Address" would like to share the life celebration of Betty Jenkins Burton. Click on the "link" to go to share a favorite memory or leave a condolence message for the family.